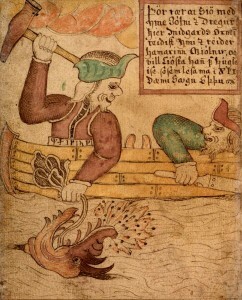 Old Norse was the language spoken by the Vikings, and the language in which the Eddas, sagas, and most of the other primary sources for our current knowledge of Norse mythology were written. Old Norse is a member of the Germanic family of languages, which also includes English, German, and several other languages that are widely spoken today. 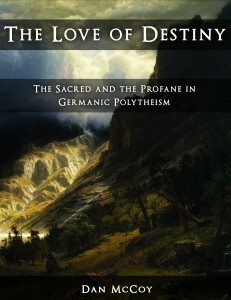 During the first several centuries of the Common Era, a distinctly northern dialect of Proto-Germanic (the common ancestor of the Germanic languages) formed in Scandinavia, which gradually morphed into Proto-Norse, which, by 750 CE or so – that is, by the beginning of the Viking Age – had become the language we would today recognize as Old Norse. Over the centuries, Old Norse continued to fragment into more regionally-specific languages, and by the early modern era, it had been transformed into Icelandic, Norwegian, Swedish, Danish, and Faroese. Just for the sake of clarity, though, when you find a textbook on “Old Norse,” it’s almost invariably Old Icelandic, since Iceland is the country that produced the overwhelming majority of the surviving literary works in Old Norse. I’ve never even seen a textbook that teaches the other dialects, but they’re probably out there somewhere. As the Vikings raided and settled in new lands during the Viking Age, so too did their language. At its broadest extent, Old Norse was spoken in Scandinavia, Iceland, the Faroe Islands, the British Isles, continental Europe, Russia, Byzantium, Greenland, and even North America. Several common English words are loan words from Old Norse, including egg, guest, gift, score, trust, anger, and want. If you want to learn about Norse mythology, there are few things that will aid you in your quest more than learning Old Norse. Dabblers will probably have no need of or interest in learning the language of the Vikings, but the more serious a student of pre-Christian Germanic/Norse mythology you are, the more useful you’ll find having a solid knowledge of Old Norse to be. This is especially the case for people whose spirituality is rooted in that of the heathen Germanic peoples; Old Norse is to that spirituality what Latin is to Catholicism, what Hebrew is to Judaism, and what Arabic is to Islam. When I began teaching myself Old Norse several years ago, there weren’t any especially good or up-to-date textbooks on the language. I did what most people who wanted to learn Old Norse did at the time: cobble together knowledge from several sources of vastly varying quality on Old Norse and modern Icelandic. (Modern Icelandic is about as close to Old Norse as Shakespearean English is to modern English, and the available modern Icelandic textbooks were of much higher quality than the available Old Norse textbooks.) Specifically, I mostly used a combination of Auður Einarsdóttir’s Learning Icelandic, Geir T. Zoëga’s A Concise Dictionary of Old Icelandic, Michael Barnes’s A New Introduction to Old Norse, and the free but very basic and incomplete lessons at Old Norse for Beginners. Luckily, however, you don’t have to go through that laborious and often confusing process anymore. 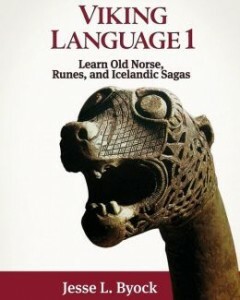 Archaeologist and historian Jesse L. Byock, the author of the excellent Viking Age Iceland and translator of numerous sagas, has written a highly useful, accessible, and engaging textbook of Old Norse for the twenty-first century: Viking Language 1: Learn Old Norse, Runes, and Icelandic Sagas. Viking Language 1 includes lessons in Old Norse grammar and vocabulary, brought to life with excerpts from the sagas and informational sections on Viking society. Graded lessons enable you to check your progress. After buying and perusing this book, I really wish that this or something similar had been available when I first started learning Old Norse. It would have saved me a lot of trouble, time, and money. Click here to view or buy Viking Language 1 at Amazon, where it’s discounted 9% from the list price. Its companion volume, Viking Language 2: The Old Norse Reader, fills a similar gap for the intermediate student of Old Norse. Before the release of Viking Language 2 in December 2014, there were few to no credible textbooks of Old Norse at an intermediate level, and certainly none of this caliber. Viking Language 2 picks up where Viking Language 1 left off, and provides guided readings and translation exercises crafted from excerpts from the Eddas, sagas, and other Old Norse texts. You’ll be reading Norse mythology in its original language! 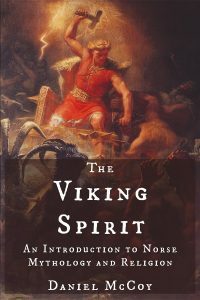 Once you’ve made your way through Viking Language 1 – or if you already have a bit of a background in Old Norse and want to go further – this second volume in the series will enable you to progress more rapidly, more comprehensively, and while having more fun than anything else you could do at this stage. Click here to view or buy Viking Language 2 at Amazon. When reading an unfamiliar text in any new language, it’s necessary to have a dictionary so that you can look up words you don’t recognize that are crucial to the meaning of a sentence or passage. Geir T. Zoëga’s A Concise Dictionary of Old Icelandic is still by far the best out there, so I recommend picking up a copy of it along with either or both of the Viking Language books. 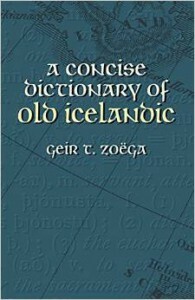 Click here to view or buy A Concise Dictionary of Old Icelandic at Amazon, where it’s discounted 14% from its list price. The Poetic Edda. Völuspá, stanza 19. My translation. Barnes, Michael. 1999. A New Introduction to Old Norse. p. 1-2. Byock, Jesse L. 2013. Viking Language 1: Learn Old Norse, Runes, and Icelandic Sagas. p. 20-23. See the entries for these words in the Online Etymology Dictionary.